Enjoy a city that contrasts modern day with history. 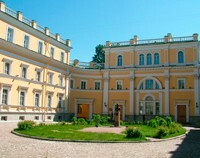 The school is situated in one of the most popular areas in St. Petersburg. There is the option of host families or shared apartments a short distance away from the school. If you want to improve your Russian level or start from scratch, whilst absorbing the vibrant Russian culture then we recommend this course for you. The school is located in the city centre, which is considered a World Heritage Site by UNESCO. The school is medium sized, allowing you to have a high quality and personal experience. There are 10 classrooms, a library, IT room, Wifi, common room and lounge. There are around 6 students per class, 10 in high season. General Russian classes are there to help you improve your fluency and confidence. You will be taught grammar, vocabulary, reading and writing comprehension, communication and listening skills. Shared apartments: that are located near the school. Individual or double rooms available, either with ensuite or shared bathrooms and communal cooking areas. Sheets and towels are provided. Host families: These apartments can be up to 10-45 minutes distance by public transport from the school or 30 minutes walking distance. Breakfast or half board included. Sheets, bedding and towels are changed every week. Our families are carefully selected so that they suit your needs, making your stay unforgettable. Informational material, proof of your progress from when you start to the end, textbooks and an accredited final diploma. Airport transfers to and from the airport, medical insurance, cancellation of the flight is not included. 24hour telephone for emergencies during your stay. A programme for cultural and social activities such as Russian art lessons, Russian singing lessons, Russian film club and guided tours are included.